EMERGING SUNSPOT, STRONG FLARE: A big new sunspot is emerging over the sun’s northeastern limb. It announced itself on March 2nd at 1746 UT with an M3-class solar flare. NASA’s Solar Dynamics Observatory recorded the extreme ultraviolet flash.NOAA forecasters estimate a 55% chance of additional M-class flares and a 5% chance of an X-flare during the next 24 hours. Solar activity is picking up. The expanding cloud is not Earth-directed. Il Solar Dynamics Observatory della NASA ha registrato un nuovo ed importante brillamento solare, un M3-class, con espulsione di massa coronale, da un nuovo spot situato sulla parte nord-est del Sole. La nuvola di radiazioni non sarebbe diretta verso la Terra. Non è escluso che si verifichi altra attività nelle prossime 24 ore.
"Mio Dio, è pieno di pianeti! - "My God, it's full of planets!" This entry was posted in Science, Space, Sun and tagged brillamenti, CME, NASA, NOAA, solar flare. tempesta solare, solar storm, solar wind, solarflare, sole, sun, vento solare. Bookmark the permalink. —> NOAA forecasters estimate a 55% chance of additional M-class flares and a 5% chance of an X-flare during the next 24 hours. 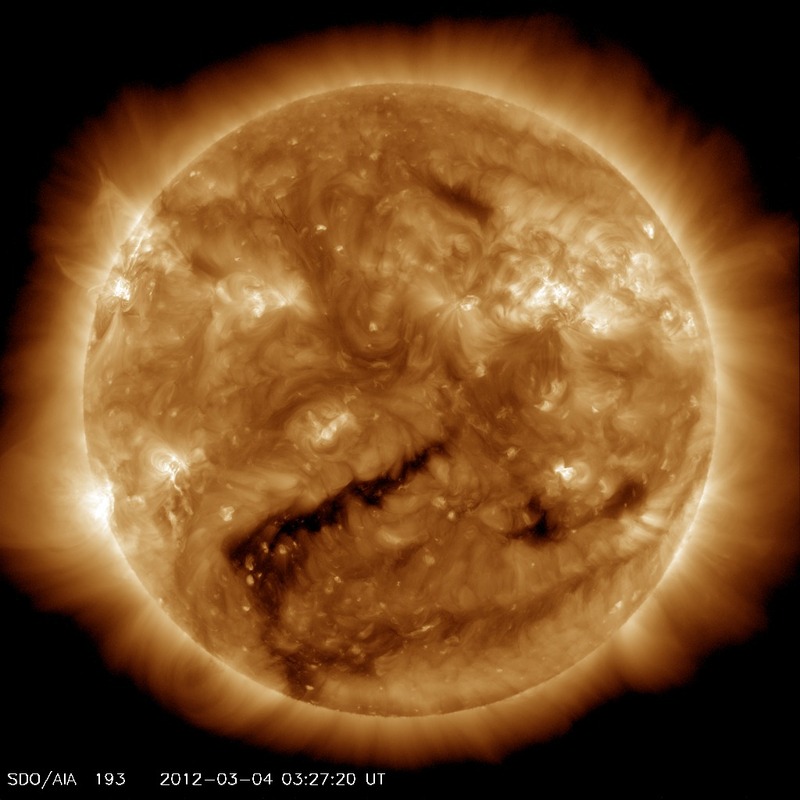 A solar wind stream flowing from this coronal hole could reach Earth on March 5-6. Credit: SDO/AIA.